Nebraska Football alum Rex Burkhead put on a stellar performance Sunday. It was a great day for several Nebraska football alumni as a pair will reach the Super Bowl. 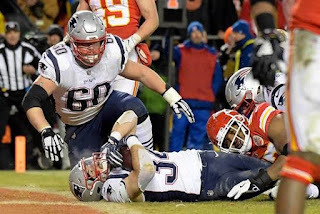 Ndamukong Suh will be in Atlanta via the Los Angeles Rams and Sunday night, Rex Burkhead played a huge role in the New England Patriots 37-31 win over the Kansas City Chiefs. When you are an offensive player on the New England Patriots, you have to accept that you are going to be overshadowed by Tom Brady. That’s just the way it has been in New England, and with five Super Bowls, that is not about change anytime soon. Burkhead signed a one-year deal with the New England Patriots back on March 14, 2017. Initially, my personal thought was that he would be merely backfield depth and not contribute much to the team. One person who did think that Burkhead would be able to make a major impact for the Patriots was my friend from college. He liked Burkhead for his versatility and his toughness and ability to fight for extra yards. I brushed him off when he kept saying that Burkhead was a vital part of the Patriots offense. After the outcome and results of Sunday’s AFC Championship Game, I have to apologize. To my friend, you were right. Burkhead has become a bigger part of the New England Patriots offense than I ever thought possible. He showed his versatility on Sunday, rushing the ball 12 times for 41 yards and two touchdowns. A 14-yard scamper was his longest of the evening. He had several key plays throughout the course of the game, none more so than in overtime when he scored the game-winning touchdown. In the second half in particular, he made a couple of key carries that put New England in better field position. They weren’t necessarily runs that would be considered earth-shattering in terms of length, but they were key in terms of field position. He also caught the ball four times for 23 yards. Burkhead got the gritty, three to four-yard runs that the Patriots needed in order to make down and distance more manageable. It is sort of fitting that Burkhead scored the game-winning touchdown. The New England Patriots have a reputation for turning players that other teams may overlook into great team players. Especially in a crowded backfield that includes James White and Sony Michel, Rex Burkhead may seem like an afterthought to some. Some of you may have not even remembered what team he was on. That is perfectly fine, because he is not going to be a running back that ranks among the elite in the National Football League. However, his grittiness and toughness will forever endear him to both Nebraska and New England Patriots fans alike. If anything, this game was just a continuation of what Burkhead did as a member of the Nebraska football program. He rushed for 3,329 yards and 30 touchdowns during his Nebraska football career. His best season came as a junior in 2011. That year, he lit up Lincoln and other college football towns, rushing for 1,357 yards and 15 touchdowns. He scored 102 total points which put him second in the Big Ten conference in that category. The 15 touchdowns rank him third in the entire conference as well. He truly had a great year that year if anything, that was a microcosm of his football career in general. Burkhead has managed to put up numbers. For his career, he has recorded 208 rushing attempts for 825 yards and a touchdowns. Although those do not scream efficiency, they certainly scream productivity. He has certainly been an asset with the Patriots ever since he came to New England. He has been a threat both in the running and passing game, and to be a running back from New England you need to be fluent in both types of offense. Sunday, he showed that he can be effective in both areas. Congratulations Rex, you have made Nebraska football proud. Now, Burkhead will face Suh in what should be a Super Bowl matchup for the ages.